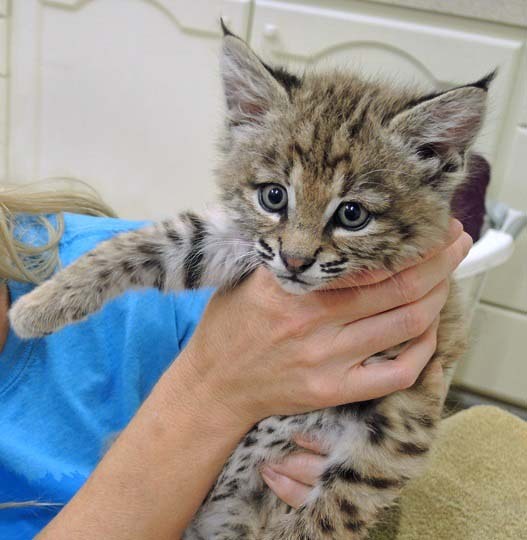 Catalina is a six week old bobcat who is our newest wildlife ambassador. Catalina was brought to us by the Arizona Game and Fish Department at three weeks old. When Catalina first arrived at SWCC we realized right away she was too used to people to be released back to the wild. Unfortunately, wild animals imprint very easily on humans when they are babies. Imprinting is when a young animal comes to recognize another animal, person, or thing as a parent or object of habitual trust. Catalina is now being trained to join the education department on outreach programs. We hope Catalina will help educate people on why wild animals do not make good pets and how to coexist with our wild neighbors. Please remember, if you come across a wild animal baby and think it might be orphaned, please call us first! We have a hotline you can call to ask questions or alert us to a wild animal in need.